Today I’m happy to have Greg Mercer on the show. If you’ve never heard of Greg, he’s the creator of the incredibly awesome Chrome plugin Jungle Scout which allows you to quickly and easily perform product research on Amazon. In addition, Greg has been selling on Amazon for quite some time now and generates revenues in excess of $400K per month. Yes, that’s per month! So I brought him on today to talk about the niche research process specifically for Amazon and discuss why he developed his tools. Enjoy! Steve: You are listening to the My Wife Quit her Job Podcast. And if you are new here, it’s a show where I bring in successful bootstrapped business owners to teach us what strategies are working and what strategies are not. Now I don’t bring on these famous entrepreneurs simply to celebrate their success, instead I have them take us back to the beginning and delve deeply into the exact strategies they used early on to gain traction for their businesses. Now if you enjoy this podcast please leave me a review on iTunes, and if you want to learn how to start your own online business be sure to sign up for my free six-day mini course, where I show you how my wife and I managed to make over 100k in profit in our first year of business. Go to www.mywifequiteherjob.com sign up right on the front page, and I’ll send you the free mini course right away via email, now onto the show. Steve: Welcome to the My Wife Quit Her Job podcast. Today, I’m happy to have Greg Mercer on the show. 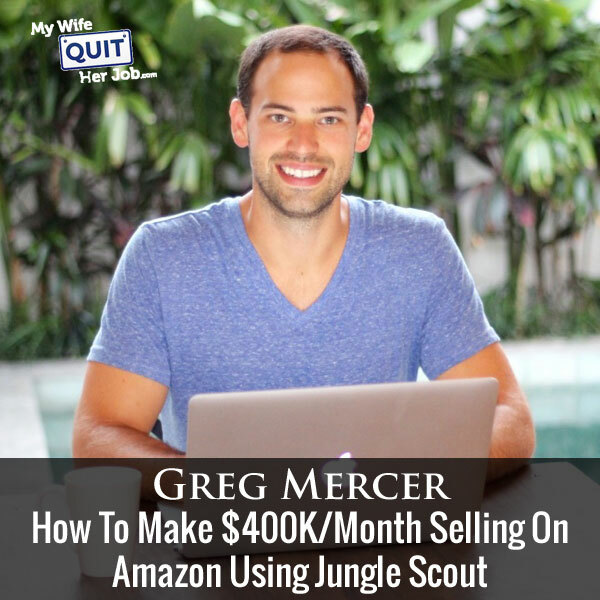 Now if you’ve never heard of Greg, he’s the creator of the incredibly awesome chrome plug in, Jungle Scout which allows you to quickly and easily perform product research on Amazon. In addition, Greg has been selling on Amazon for quite some time now, and he actually generates revenues in excess of $400,000 per month. And yes that is per month, not per year. So I brought him on today to talk about kind of the niche research process especially for Amazon and discuss why he developed his tool. And with that, welcome to the show Greg, how are you doing today man? Greg: I’m awesome. Thanks for having me Steve. I’m really excited to be on here. It will be fun. Steve: Yeah great. I kind of– I did a little bit of research and I understand that you used to be an engineer. Steve: So how does one go from an engineer– we kind of have some of the background, I almost want to say, so how do you go from engineer to Amazon seller? Greg: Yeah, so I didn’t hate my engineering job. It was okay. I just didn’t love it. I’ve had this kind of entrepreneurial spirit my whole life and I just wanted to really do my own thing. So essentially one day I was just kind of looking for other sources of income, and that’s where it all started. Steve: Okay, and then, so how did you go to selling on Amazon. How long ago was this by the way? Greg: It was about two and a half years ago now. It’s like at the beginning of 2013. Steve: Okay, so not that long ago. And then you started out on using FBA? Greg: I did. Originally it was just kind of playing around a little bit. I was selling a few products just to kind of get the idea to get my feet wet. And quickly I realized how powerful the channel it was. So early on, I actually partnered up with someone who already had an existing ecommerce business. And that was pretty helpful for me because he was able to introduce me to some of his suppliers. Back then I was just sourcing products from traditional wholesalers. So it was kind of a lot of the products that he was already sourcing, but Amazon was on [inaudible 00:03:29] for him. So that’s how I got started on Amazon. And then just within– just like this past year, or maybe a little over that, is when I found out about this private label model that’s become a little more popular today. And since then I’ve shifted a lot of my focus towards that just because it’s an amazing business model. The margins are way better; you just have a lot more control since you are not sharing the “buy” box. The listings are yours. You can put a little more effort into making them pretty and getting reviews and that kind of thing. So today I still sell some wholesale products, probably sold more than half of my revenue. Maybe like 60% comes from traditionally sourced wholesale products, and then the rest are my private label products. Steve: So for wholesale would you say that your margins are anywhere like 50%? Steve: I just meant like the straight products, like what you are sourcing it for and without Amazon’s cut. Greg: Yeah, without Amazon’s cut, I want to clarify that. It’ll be closer to like 20% or 30% without Amazon’s cut. Steve: Oh wow, because then Amazon takes 15%. Greg: Yeah, it swims. So it’s more of like a high volume low margin approach where my private label stuff, I usually get 100% return on investments. So if I’m buying a product for ten bucks I usually make $10 in profit when I sell it. Steve: Okay, that’s [inaudible 00:05:06]. Greg: That’s way better, right. So you can see why shifting focus towards that. But at the same time it’s a little more to get started, but in my opinion it’s well worth it. Steve: Okay and then do you like recommend that people kind of start with the wholesale out, because it’s kind of a little bit easier or do you recommend that people just jump straight to the private label route. Greg: I would jump straight to private label. One of the reasons I say that, is that it’s kind of tricky to get wholesalers to sell to you if they know, or if you only want to sell on Amazon. This is what I found at least. A lot of them, they are not capturing any more market share by selling to the tenth seller for that item on Amazon. So a lot of times they are hesitant especially if you are a real small operation where as sourcing these products from overseas from China or wherever, like those sell to anyone. So the barrier of entry is a little bit smaller in my opinion. So if I was starting over today, I would just be focusing on the private label model. Steve: I’m just curious. So you do a lot of volume every single month, but do you have your own website or is it mostly revenue, or all of it based on Amazon. Greg: I have like little kind of like fake websites set ups, but it’s all on Amazon. Steve: Okay, so these websites are just so if someone Googles your brand or something, they’ll find a site. Greg: Yeah, it’s really simple, like one landing page, you set them up in an hour. And then if you are like– there’s one like shop now button and that takes you to the Amazon seller’s page. Steve: Oh, I see. So the site kind of just points to an Amazon listing where they go and check out. Greg: Right and that’s just to add a little bit of legitimacy if they were to Google it. But like I said, I don’t spend more than an hour on it. Steve: Okay, okay. And just curious, do the products that you sell, kind of have anything to do with things that you are into, or do you just kind of pick and choose what’s profitable. Greg: I just pick and choose what’s profitable. I don’t really discriminate against anything. Most of my– a lot of my wholesale products are in the health and personal care niche. So when I was first getting started with the private label stuff, I was kind of looking for similar items to what I was used to selling. But since then, I was like I will sell anything. Steve: Okay, so are there– so you probably have some sort of preferences, are there any specific categories that you like to start out with, assuming private label of course. Greg: Yeah. Some like the higher volume categories are probably better to start out with. Those will be like health and personal care, like the home and kitchen, kitchen and dining type of stuff. But at the same time, if you find a good product about any category I would say go for it. I don’t even have two stronger preferences in any particular category anymore. Steve: So just to even brainstorm ideas, like do you have a process for doing so or do you just kind of randomly type in stuff in Amazon, use Jungle Scout and then figure out what a good product is? Greg: Yes, so I’ve got two areas that I like to look for products. One is– and this is pretty well known, it’s like the Amazon’s best seller section. So if you just Google Amazon best sellers, it will just take you to this page. And when you click on the categories, they will be on the left hand side. That will take you to products that are like one, the top to a hundred ranked price in that category. And those are going to be super competitive products. There’ll probably a lot of sellers on those, but what you can do is if you drill down into the sub categories, by continuing to click on the sub categories again they will be on the left hand side, you can get into like a second or third, or fourth sub category. Those won’t be as competitive but will still give you good product ideas. So that’s one good spot to look for ideas. The other one that a lot of people, I think it’s a little bit more untapped, I call it kind of like spying on my competitors. How you do this is, I’ll go to someone who I just know either knows a private label seller, or is maybe competing on some of the products that I’m selling. You can go into their seller store front and then from there you can look what’s selling well. You can do without Jungle Scout as well. It’s really easy with Jungle Scout, but even if you don’t have it you can go and click on each of the items and see which items have a low rank which means they are selling well. Of course, we make Jungle Scout so I’m using it, but if you use it, you can extract a few pages and then sort about which ones are selling well so then right away you see, okay, this seller has 100 items, but only maybe like ten of those are selling really well for him. So then I’ll look into those more. A lot of times, maybe you are not even going to sell like that, like a copy cat of that item, but you will just kind of spot product ideas. So maybe they are selling like a Mexican yoga blanket, I think this is an example; I was looking at that a few days ago. Maybe you are not going to sell a particular Mexican yoga blanket, but it will spark maybe the idea for like a beach blanket or something like that. So it’s just a good way to get product ideas. Steve: And so if you can just like walk me through like one of your typical product runs. You mentioned Mexican yoga mats or what not, but can you just maybe like a recent product that you decide to sell, and I understand you are constantly researching your products, so can you just like walk us through the process? What you criteria is and kind of what like a typical brainstorming session would look like? Greg: Yeah, absolutely. So I guess, I kind of prefer the spying on the sellers methods. So maybe I’m just spying on different sellers, and I just open up some new tabs for product ideas. Steve: How do you know which sellers you want to spy on? Greg: You can either– if you see people are kind of competitors of yours you can try them. Another way is you can go into a lot of the really popular, really competitive product private label item. These will be like silicone grill gloves, the garlic press. Steve: Garlic press. Sorry, go on. Greg: The spatula, the yoga mat, some of those things and like the top 20 sellers are all private label sellers. You could click into there and see what else they are selling. So they may not open up like ten tabs of my favorite items, and then from there, I will take the main key word. So if we use, we use this Mexican yoga blanket again. So maybe the main keyword in there would be yoga blanket. So then I’ll just search for that general term, just on the Amazon store and then once on there, I’m looking for a couple of things. I want to know that the demand in high enough, yet it’s not too competitive. So the thing I use to estimate demand is I like to see that there’s 3,000 units of that product being sold through that key word. Greg: A month, that’s correct. And the reason I say that is, me personally, I don’t want to take an item that I’m not comfortable to sell ten a day. In any market I’m willing to enter, I feel like I can capture about ten percent of the share. So that’s– and it’s just a number that I use a as general rule of thumb. You can of course use something different, but that’s what I prefer to use. Steve: Okay, and in terms of the selling price? Greg: Yeah, the selling price– I used to say I wouldn’t want to sell anything less than $15, but later I’ve actually gone a little bit more picky, I prefer something minimal of like $20 or $25 just because it’s so much easier to make some money on the higher price items. Once you get that done to a $15 or a $10 item, there’s not a whole lot. Once Amazon takes their cut, there’s not a whole lot of money left over to purchase your item and profit. So minimum $20 or $25 is what I would recommend. I’d actually say there’s an upper level of that as well. I think above, maybe around $50, is when there’s less just like impulse purchases. People want to learn maybe a little bit more about the brand. So that’s kind of the price range I look at. $20-25 minimum, maximum of like $50. Steve: So the reason you put an upper bound on the dollar amount is because you mention that people tend to care more about brand once you’ve exceeded this level? Is that the real rationale? Greg: Yes. That’s my rationale. As an example, if I’m buying like a $20 or $30 product, if I’ve never heard of the brand before, it has good reviews, I won’t think twice about it. Once I get to some of these that are more expensive stuff, it’s like you might want to do a little more research, look into a little more. So that’s my rationale on it. Steve: Okay. And I was just curious, you mentioned that you have these one page websites for your products, for those products, are those your more expensive ones, or do you just do for every product that you sell. Greg: So I’ll actually do– so I have five different brands. And inside of these brands, I’ll have multiple products. So I’ll set up a website for that particular brand, not necessarily the product. So they search the brand name, they’d be taken to that website and then from there- some of them don’t actually have the product listed on it. It’s just like a just a general space, a little bit about the company type of thing. We feel like we create the best products, some of the little things like that. Steve: Okay. Just to explain the brand a little bit without mentioning specific products. Greg: Yeah. I think on a couple I might do some specific products, and then as my product lines have grown I just haven’t kept up with it to be honest with you. Steve: Okay. And then this, you make like on your order 400K a month, how many products makes up that number? Greg: Like, how many skews do I have listed? Greg: I have, I think around 300 or 400 skews. Greg: A lot of those though are like items from my wholesalers that will only sell like five a month. So there will usually be items that I took on hoping that they’d sell a little better and they didn’t. For my wholesale stuff, I’ll take an item if it’ll just sell like one a day, like thirty a month. Some of those are little low volume. All my private label items, I think are like in the mid 40s private label skews and all of those, I would like to make sure that they’re sell a minimum of ten a day and a lot of them have done better. Of course there’s a few that do worse, maybe will only sell three, four or five a day, but the majority of them actually I don’t know– it’s probably around 14, 15 by average sales per day. Steve: Okay and it just seems like you kind of recently shifted in like the last year, year and a half to this private label method. So you have all these regular wholesale products still lying around, right? Greg: Yeah exactly and the thing with them– some people are like why do you still sell them? It’s pretty easy just to reorder. I already have the relationship established with the wholesalers. So it’s pretty easy to go ahead and just place an order for a few more of those units from that person. So that’s why I keep selling some of those. Steve: Do they ship directly to Amazon for you or what’s the arrangement like. Greg: No, I still have everything shipped to my I call it a warehouse. It’s pretty pathetic. It’s a pretty pathetic warehouse. We still handle each product before it goes into Amazon. Yeah I don’t have anything shipped directly to Amazon right now. Steve: Okay and so let’s continue on with the product criteria. So you mentioned price, you mentioned you like to make at least a unit that sells at least ten a day. Any other specific product criteria like for example, I recommend that my students don’t sell electronics or anything that go obsolete, do you have any sort of product criteria like that? Greg: Yeah, a few of the things that I look for are– I prefer it to not be classified as over sized in Amazon especially if it’s your first product. I forget the exact dimensions, I think they are like 8” by 14” by 18” but it’s roughly the size of a shoe box is how you can think of it. If it fits inside a shoe box it will be most likely to be classified as a standard product as opposed to over size. So I’ll look for that, especially if it’s your first product. If you are starting out an over sized item, Amazon puts a limit, I think you will only store like 500 in their warehouse at a time. There’s a large jump for the fulfillment fee from Amazon if it’s an oversize product. So most of my stuff, I try to get the smaller products. I prefer to be light weight because I like to ship most of the stuff on air– air shipment from China as opposed to ocean freight. Greg: Yeah, especially starting out. I have started to ship more stuff ocean freight, but it’s a huge headache. Don’t get me wrong. Shipping air like DHL or something from China it’s super easy. They take care of all the customs for you. It’s just like ordering something in the states. So at least just getting started like my first order with a supplier would be a smaller one, maybe like 500 units and those I always try to ship those via air. Steve: So these are like super light products right, because the dimension returns for air happens around 200 pounds I think, like is it 200 or– where it’s like a lot cheaper to ship by sea. Greg: Yeah, more so I’m going for the speed, what it gives to me as opposed to the price. So yeah, pretty much all of them would be cheaper to send ocean freight. But if you feel green, okay that’s 30 days I lost sales, because that’s how much longer it takes on ocean freight, then– yeah I usually try to get them into Amazon as quick as I can to confirm that it’s a good product, that the supplier meets my expectations as far as quality and stuff. So I’ll always ship that first order sometimes even the first two or three orders air freight. Steve: Okay, let’s say I have– oh sorry, were you continuing on with criteria. Did I cut you up? Greg: Yeah, I think I got a little off track there, I’m sorry. I usually go for something that is simple and not easily breakable as well. I wouldn’t do anything like glass probably or anything complex, like complex like electronics like you said. Couple other things that I look for is that I try to avoid products that have a potential high liability. Kind of as my business grows, I get more and more worried about this kind of things. So I personally wouldn’t carry something like knives or maybe something that would burn people. Me personally I like to stick away for those higher liability products, and then of course you want to stay away from anything that is patented or illegally licensed. It wouldn’t be license but yeah. That’s my general criteria for me. Steve: Okay, and then so let’s say you have an idea and you type it down on Amazon, and maybe it’s time to explain what Jungle Scout does. So I’ll explain it for you just for– and if I get anything wrong, just feel free to correct me. You type in a product on Amazon and what Jungle Scout does is you hit this nice button in your browser, and it lists all the products for sale, all their prices, an approximate revenue number for the last thirty days, how they are selling it, all the information nicely tabulated in one little mini spreadsheet actually that pops up. And so you can easily do product research, pretty accurate there Greg? Greg: Yeah, that was a good one. Steve: So let’s say, I’m doing that. So I type in a product and I’m thinking about selling and I bring up this nice Jungle Scout’s spreadsheet of all the products. So what are some things that you look for in terms of the competition? You mentioned sales already. So we got that down. How do you evaluate whether you’re going to have a chance? Greg: Yeah that’s a good question. So like I said, with the demand, I like to see a minimal of 3,000 products like keyword. So it’s pretty easy if you have the Jungle Scout window to kind of look like really quickly estimates sales. For the competition, the easiest thing to look for is the number of reviews that your competitors have, or the top ten people that are ranked there, how many reviews they have. So I like to see somewhat in the top five spots for that keyword, or for that product type having under 100 reviews, and in the top ten spots, I like to see two or three maybe four people with under 100 reviews. I think it’s pretty obvious the number of reviews, the quality of the reviews also is a major factor in Amazon’s ranking algorithms. And also if someone sees a whole bunch of products that will have like a 100 to 500,000, reviews they are more likely to purchase one of those. So I want to see someone that has a lower number of reviews because that is something that I can more easily compete with. By giving away some products, I can go ahead, you know these people that have under 100 reviews, I can compete with them pretty easily. Steve: Okay, so what if you see like a struggler that has like a 1,000 amongst a sea of hundreds or low hundreds? Does that affect you at all or? Greg: I probably wouldn’t be scared on that one especially if– and some of the other things that I look for, is like the quality of reviews– excuse me, the quality of listings and the quality of pictures. That makes a huge difference. So even if I saw, somebody who had 1,000 reviews, maybe that product doesn’t have a very good listing, maybe it only has one picture and it’s kind of poor. Those are the kinds of things that are good to see and say, you know, I can take really good photos, build a really high quality listing and then I should be able to compete with these guys without much problem. Steve: I remember you mentioned earlier that you like to pick cheaper items that brand doesn’t matter, but what if you see a lot of well known brand names in the subject results? Does that kind of sway you at all? Greg: That might be a little bit of a flag for me. In general I stay away from products that are like people strong brand allegiance for instance like clothing. A lot of people like to buy like name brand clothes, whereas something like for instance, a water bottle, the brand name probably doesn’t matter as much like a water bottle. Yeah, if I saw all of the items had like well established brands, that product would be a flag to me, something I want to stay away from. Steve: What if like the same brand that you’ve never heard of is like occupying the top 8 spots or something like that? Greg: No, I don’t think that would really scare me much as long as I felt like I could get in there and compete with the number of reviews and the quality of listings. Steve: So your main criteria it sounds like just is just a number of reviews when you’re evaluating the competition basically. Greg: Yes, that’s 90% of it I would say. Steve: Okay, and then what about in terms of like the number, the sheer number of people selling similar products. Does that affect you at all? Greg: Yes and no. Generally if you go by that review criteria you will find that like the entire first search page isn’t filled with people selling the same item. But yeah, I mean if I searched for instance, when you search for like yoga mat or some of these other competitive ones like the entire page is filled with other people selling really similar items, that would be something I’d try to stay away from. I like to see– so you have to start to thinking about little more like kind of strange like weird items like the Mexican yoga blanket. When I search that, you’ll probably find that there’s only like five or eight people selling that type of item. Steve: So do you have a certain number for like the number of searches also you like to see pop up? Greg: No, not necessarily. I’ll more just like to see that the whole first page isn’t just full of that item. It’s a really good sign if for instance if you were to search for– I’m not very creative, I’m running out of ideas here. If you were to search for stainless steel water bottle, and you saw like the first, say in the first five results like three were actually stainless steel water bottle and the other two were plastic ones, that would be a good sign because that means if you were to create a stainless steel water bottle you could probably outrank those plastic ones. That’s not what people are searching for if they are searching for stainless steel water bottle. Steve: Okay. Let’s switch gears a little bit and just kind of talk about like the whole product sourcing model here. So first of all, where do you get all your stuff from, the private label products? Greg: All from Alibaba is where I find the suppliers. Steve: Okay. So all of your suppliers have been on Alibaba because I remember you mentioned earlier that you had a friend that pointed you to some of his suppliers. Was that just a domestic wholesaler? Greg: Yeah, that was for wholesalers. Yeah, all my private label stuff is sourced from overseas. I found all of them through Alibaba. Steve: Okay, and what are some of the margins that you kind of look for, and what’s your strategy for dealing with some of these vendors? Greg: Yeah, in general, I just like to make 100% return on my investment. So if I’m sourcing products for ten bucks, I like to make ten dollars profit. Dealing with the suppliers can be a little bit tricky. I think I’ve gotten better at this, but I still don’t think I’m great. Greg: I’ll normally email as many suppliers as I can find for that particular item. So we go back to stainless steel water bottle. I might email like 20 suppliers. Every supplier I can find for this water bottle. It’s just a copy and paste, it kind of template I have. I try to sound especially if you are starting out; I try to sound like a pretty big corporation. Maybe I’m a purchasing agent. We feel like we can do a lot of volume, things like that. But often, even when I email like 20 suppliers, I think that a lot of people get these results, but they are only like five will be back or maybe eight. And then from there, that’s when I start trying to see which ones are the best. I look for things like how well can they– do they communicate with me, is their English pretty good, do I feel like we are on the same page? Do they get back to me quickly? And then from there, I’ll start talking about ordering a sample from the ones that make it through that stage. Steve: How many do you narrow it down to before you start asking for samples? Greg: Just as many good ones as I can find to be honest with you. If I found five good suppliers, I probably try to order a sample from all of them. But actually I’ve rarely found that’s the case. Usually it’s only like two or three suppliers that feel like I would be willing to work with. Steve: Okay and so you order these samples and I imagine it’s just like one or two, right? Greg: Yeah, so I’ll just order like one or two, sometimes just about always they want you to pay for shipping. It’s very rare they are willing to send to you without paying for shipping. Sometimes they’ll also charge you a small fee for the sample. I wouldn’t worry about this too much. I know some people are kind of worry about that. It’s like, just go ahead and pay for it. You’re going to want a sample before you order 500 or 1,000 products. Steve: And do you jump from– so, once you’ve gotten the sample, and you’ve kind of examined it, what is the next logical order size that you typically make? Greg: Yeah, it’s a good question. So this actually recently changed with me. I’ll tell you my advice on it. I used to always make an initial order of 500 units. And what I’ve found is that actually it isn’t enough. I like to start with smaller orders just because if I were to get a really bad factory and their quality was poor, I wouldn’t want to be stuck with the whole bunch of units. So that’s why I use to do 500. Now I do 750 or a 1,000 and the reason was I was always running out of stock. Because the lead time for a lot of these factories even if you are shipping air, is usually about 30 days, a lot of times I find it to even be more like 40, 45 days. And if you order 500 units, if you give away 50 or 100 to get started and get some reviews, if the product does well and you are selling 10, 15, 20 a day, you are always going to run out of stock before even if the day that your first shipment gets into Amazon if you reorder I find myself I was always running out of stock. So now I actually — I usually order about 1000 for my first order now. Steve: That’s interesting, so have you ever gotten burned with that product in that first batch? Steve: Yeah, I have been doing it for a while; I have some horrors stories too, so I was just curious yeah, you are just willing to jump right to the — well, I’m just curious, what would you do if you did get a shipment that was unacceptable? Greg: Yeah, that’s a good question, so for instance when I had the boxes right away I just try to work with my supplier, he was willing to send me like 1000 new boxes, but that required me unpacking and repacking all of them. You’ll probably just going to have take on a case by case basis, just try to work with your supplier kind of try to think about what motivate him maybe say like I want to work with you long term, but I need to get this one fixed. Can you send me new units or…? Steve: Do you use a third party inspection company in China? Greg: I haven’t yet, I probably will once I get burned for the first time. I keep saying I’m going to, and then I guess I just kind of been lax days ago about it because so far I have had nothing but pretty good experiences. Steve: And this is across 40 different skews and how many different suppliers is that, that make up 40 skews? Greg: Right, so it’s only probably 15 suppliers. So I do try to — so after I find one good item with the supplier and I like the supplier, a lot of times I’ll ask them for their catalogue like what are the products they are already manufacturing. And a lot of times even if the — maybe the product is not going to be as good as what I had hoped if I was establishing a relationship with a new factory, maybe it’s only going to sell – maybe I’ll estimate it’s going to sell five a day. A lot of times I’ll take that on anyway just because I have established relationship, I know they are doing pretty good work. And then from their own there are some economies of scale associated with that, so yeah, so I have to say about 15 suppliers. Steve: And I guess that 500 unit quantities, you probably don’t have minimum quantity problems for most suppliers I would imagine? Greg: Occasionally you’ll run into suppliers that only want to work with real high volumes. A lot of times you can talk them down if you say like look this is just a sample, we are just testing your quality. A lot of times they’ll be like I really want to with you, but my boss he likes to build a relationship really slowly, he’ll only let me order 500 or 1000. And occasionally a factory would say no I don’t want to deal with you, and just go on and look for another one. Steve: Okay and you know how Alibaba when you look on there, it tends to give you a range. What has been your experience on the actual range of price versus the number of initial units that you are willing to purchase? Greg: I think the numbers on Alibaba like don’t mean anything. Greg: I think they just throw out numbers there because sometimes say their MOQ is like 10,000 and they are willing to sell only 500 or the price range is way off. So I would recommend go ahead and contact a factory no matter what they claim their MOQ or prices for a product. Greg: Right, yeah, I don’t even really look at those anymore I just go ahead just email the factory and then just try to work with them. Steve: Okay, that’s cool. Okay, so let’s — okay, so we are done with the product sourcing, we got our samples, let’s say we got our first 1,000 units or 500 units whatever, what’s the next step, you get that thing on Amazon right? Greg: Get it to Amazon exactly right, I can’t stress the importance of a high quality listing. Really good high quality photos I would say like at least five of them. I would recommend probably trying to hire someone to do this unless you already really good at photography because it makes a big difference. Make sure that all of your bullet points are filled out, you have good information there, you can try to include some keywords, anything people will be searching for in there, that’s good idea. And then yeah just a good product description, you’ll find like a lot of products on Amazon like say really popular price that Amazon sells, really have like pretty like crappy listings. Like they only have one photo not many bullet points, so you can really stand out by having — yeah, just really high quality photos that make people feel like they know exactly what they are getting and yeah. Steve: Do you use any tools to come up with the keywords for your products? Greg: Usually for my initial listing I won’t use any tools for it; I’ll just brainstorm off the top of my head. Occasionally I use Google keyword planner but not so often. What I will do though is– and we are kind of jumping ahead here, but I’ll set up an automatic pay per click campaign which Amazon chooses keywords for you, and then if I find a keyword that is performing really well, I’ll try to go back and include that into my listing. Steve: Okay, got it, now do you start running these pay per clicks as right off the back or do you get your initial reviews first? Greg: I’ll usually — sometimes I’ll go ahead and run like a light pay per click campaign like maybe just like $5 or $10 a day. But I usually wait until I have at least ten reviews to kind of turn it on a little more. Steve: Just curious, so let’s say you are like a complete newbie and you had nothing, how would you get your first reviews? Steve: Where do you find these facebook groups, so it’s just groups within your niche is that what you are talking about or? Amazon product reviews or something like that, you’ll find a few. Steve: Okay and there’s nothing like making them actually leave the review once they’ve gotten their product, right? Greg: Right, you just ask an exchange for this deeply discounted product you would appreciate a review. And that’s within Amazon’s terms of service; they’ll allow you to give away a product for free or deeply discounted and request a review in exchange. Yeah, definitely don’t say anything about like I’m only going to give this away for people who are going to leave me five star reviews. Amazon’s– they are definitely smart, they know that the integrity of the review system is very important for the customers who trust them. So yeah, I would recommend 100% planning by the book on that, but — yeah, there’s other good websites as well that do the same thing, they kind of connect sellers who are willing to give away discounted products with reviewers that are looking for good deals, they don’t mind leaving as review. Steve: Do you have any favorites? Greg: I have used about all of them. Greg: Yeah, I know snag shells [ph] one, the AMZ tracker, I think there was like, I love to review, there’s review kick, so yeah, go check out some of those. Steve: So it sounds like you don’t use them anymore, what’s your strategy right now to get your first initial reviews, and for you? Steve: Interesting, so you created your own email list of people who want to review your stuff. Greg: Yeah, so I find it’s really easier to do. Steve: Yeah, I know everyone loves free stuff right? Greg: Yeah, exactly that’s why it spreads so quickly it’s funny, and now I don’t even — I have no idea who like 99% of the people are, and they probably don’t even know me. Steve: How big is this list? Is it like thousands? Greg: No it’s a couple of hundred. Steve: Okay, so just curious, so you got your product up now, what are some of your philosophies on pricing? Steve: Can you show an example of that or is that — are you — okay. Steve: And did you emphasize that metal buckle on your bullet points too? Greg: Oh, yeah, absolutely and like my initial picture kind of zooms in on that, like I emphasized that it’s heavy duty and — so yeah. Steve: Okay, interesting, okay, so it sounds like your strategy, there’s more to your strategy right? You look for bad reviews, how you can improve the product, do you do that on your first batch? Steve: So with the ones that where there is just like what everyone else is selling, do you still price those higher than everyone else? Greg: I definitely won’t get into any price wars, I’ll always usually like match the highest price. I found that if you have like a really good listing and you are getting good reviews that people are — especially if it’s only a dollar or two. A lot of times if one item ranked five stars, and then went four stars and it’s like a dollar or two more expensive, a lot of times people will pick that, so yeah I definitely won’t get in any price wars with anyone. Steve: Okay, yeah, no it’s interesting, so do you — you just try to make sure that your listing is as nice as possible, and then you just kind of price yourself on the higher end, is that kind of accurate? Greg: Yeah, I’d say it’s spot on. Steve: Okay, cool, yeah, so let’s switch gears a little bit and talk about Jungle Scout, because this is — it’s a cool little plug-in, and how did you come up with the idea, and what was like kind of the impetus for you to create this tool? Greg: Yeah, absolutely, so I came up with the idea because I was actually — I used to create spreadsheets with all of the information that Jungle Scout gives you. So I would go in, I would click on each particular item, I put it in a spreadsheet. I put the price, the category, all the stuff. I was using like– back at time a calculator that wasn’t very accurate to estimate sales. See what I found as I was creating these spreadsheets I was like man – it was like it’s the largest [inaudible 00:43:19] in my business like find a new product to sell, and doing this product research it was terribly time consuming. So one day I just kind of came up with the idea. We started using it kind of in house for — we did it like a couple of months until I showed a few buddies about that, they are like man you really need to sell this. Yeah, so the rest is history. Steve: Okay, so you basically created it out of your own needs essentially? Greg: Yeah, absolutely because — so yes, so now instead of going and clicking on each item and making the spreadsheet, now you just hit the little JS button in it, it creates this spreadsheet for you within a few seconds. So yeah, it makes it so much faster, and then since then we’ve improved on it a lot like our estimates sales equation are really accurate now. Well actually, that’s always a question for everyone, so I’ll tell everybody how we do that. Well, actually we follow like around 40,000 or 50,000 items on Amazon on a daily basis, and we track how many products they sell, and what their sales ranks are? So then at the end of each month we’ll have like over a million data points, and we have a data scientist who works for me, she is super smart and from that she can model at each month to see how well the items are selling on Amazon. So that’s obviously a huge, very beneficial to know, the estimate sales revenue each month, to get an idea of how much volume that product in your competition is doing. And then yeah, since then we’ve added like FBA Feed calculator, and little price and sales ranks history of gross, we integrate Google trends in there and so yeah, now it just makes it so much quicker and easier to do your product research. Steve: How do you get the sales data of these 40,000 or 50,000 products? Greg: We’ve built a data collection system to follow all the items, so as you probably know Amazon doesn’t publish its information, so you kind of have to get creative and get it yourself. Steve: Interesting, okay, I’m just curios how you do that, are you willing to reveal that or? Greg: Yes, so I mean we just do — do you know like 999 cart trick? Steve: No, is that when you list something really high, and off of [inaudible 00:45:43], and you get their traffic data or? Greg: So yeah, you can go into an item on the Amazon store and try to add 999 to your cart. And if there’s less than 999 in stock, it will give you an error and say, there’s only like 350 in stock. So when — today that selling has 350 in stock, now if we would do that a few times a day for a whole bunch of days in a row, we could figure out exactly how many they are selling each hour, day, month. Steve: Genius, okay, I got it, that’s very clever cool. Greg: See you can actually do this trick too if you don’t have Jungle Scout, if you just want to know how many products an item is selling, if you want to kind of follow them for a few days yeah, that’s how you do it. Just try to add, it will only let you add 999 to your cart. So the only downsize is if they had over that in stock they have like a thousand or more in stock, it will just let you add 999, and then you have no idea. Steve: Awesome, so you got this tool and it seems like a lot of people are using this, how did you actually get the word out about the tool? Greg: Yeah, I started with just — I think telling a few friends about it. And it really just spread like wildfire like I’m a terrible marketer Steve. Like I have no marketing background like I was an engineer, I’m horrible at it. So the only thing I guess like I was only good for the like the product development, like the data side of it. So thankfully it just spread with word of mouth like crazy, because otherwise probably no one would ever know about this. But yeah, I mean since then I get the word out from obviously interviewing me on your podcast, other people have asked me to come on theirs. What I have really found is I just try to be — I’m not the type of person that tries like hard sell anything really. It’s like awkward to me, I don’t like doing it, I’m not a good sales person. So I just try to like generally help as many people as I can with like product research, like whether I’m telling about Jungle Scout or not. And I found that it’s just a great way to do it, everyone appreciates my help, and they are kind of interested about Jungle Scout, so just try to be a great helpful guy. Steve: That’s awesome, that’s incredible, okay, now I was wondering if you had some insights, because it has spread like wild fire in a way. So it seems like you haven’t done much and it’s just been mainly word of mouth, which is pretty amazing. Greg: Yeah, for the most part since I have tried to learn about like Facebook ads and a few of these other things, and I have like severely under optimized campaigns running for some of these stuff. But yeah, for the most part it’s just word of mouth, and yeah just kind of helping people out with their product research. Steve: Cool, Greg, hey, I want to be respectful of your time, we’ve already been chatting for almost 50 minutes. If anyone has any questions for you, or is interested in Jungle Scout where can they find you, do you have a blog or anything? Greg: Yes, I’m actually working on getting a blog up, I don’t know when it’s going to be released, maybe check back in a few weeks, you could probably find a blog at Jungle Scout. Feel free to email me if you have any questions about Jungle Scout or just Amazon sales, or product researching in general, you can email me at greg@junglescout.com. Greg: Yeah, we’ve set up a little discount for your community Steve, so if they want to find that they can do so at junglescout.com/mywifequitherjob. Steve: I will put that link in the show notes so anyone who is interested — I actually really love the tool and I highly recommend it. If you find yourself needing to do a whole lot of products research in Amazon, then it’s a no brainier. Well, hey Greg, thanks a lot for coming on the show, and I really appreciate your time. Greg: Absolutely, Steve thanks for having me, it’s been fun. Steve: Yeah, man, take care. Steve: Hope you enjoyed that episode. Greg is someone I refer to as a triple threat, one he’s got a great personality, and he is an incredible people person. Two he is smart and business savvy, and three he is technical and can create anything out of software. So I highly recommend that you check out his tool Jungle Scout and actually look for a 10% coupon in the show notes when this episode is published. For more information about this episode, go to mywifequitherjob.com/episode93. And if you enjoyed this episode, please go to iTunes and leave me a review. It’s by far the best way to support the show, and please tell your friends because the greatest compliment that you can give me is to write a referral to someone else, either in person or to share it on the web. Now if you are interested in starting your own online business, be sure to sign up for my free six day mini course where I show you how my wife and I managed to make over 100K in profit in our first year of business. Go to mywifequitherjob.com, sign up right there on the front page, and I’ll send you the free mini course right away. Thanks for listening. Great episode! Great timing with the webinar you did with Andrew last night. Just want to thank you for the valuable tips and answering my questions. Was great chatting with you guys. I hope you and Andrew team up again soon for another one! The REAL question is can this still be done? I’m assuming not if we’re talking specifically in the same fashion that Greg has done it. Meaning if we we’re to use the same techniques as he we would only make a fraction of what he makes with (specific products) that he is selling? Due to the fact that he basically is the most established seller with the product niches he is using this technique with. If one really wants to do this they would have to beat him to a specific product and the out compete him. The ball is most likely is his court due to the simple fact that he hasn’t told us everything in this podcast because it would not best serve his interest (naturally ). Yep, this business model still works very well for now. 5 years down the line, things will probably change. Xavier, I mean no malice when I say this, but you make it sound like making a fraction of $400K a month would be a bad thing? Even if you couldn’t replicate his exact earnings, the knowledge you gain is still invaluable in my opinion. Just my .02. Steve I requested the online course twice can never got email we have been listening to you tube but really want to move to the next step.